My sweet boy Yoda has always had a slightly shorter tail than his sister Winky. I first noticed about a month after they came to me that he had just the tiniest bit of dark color at the end of his tail, while Winky had a few inches of dark. I've been noticing lately that he has almost no dark tip on his tail at all anymore. I've also noticed him sometimes chewing on the end of his tail (grooming aggressively?). This morning I got a good look at the very tip of his tail, which is visible without fur on it. There is a tiny scab on the tip, but the surrounding area doesn't appear pink or otherwise infected. He is such a mellow glider that I'd be surprised if it was an anxiety behavior, but I can't think of any good reason why he should be chewing what appears to be a healthy tail. Photo attached of the tip of his tail. I'll try to get a clearer photo later. I'm sure you know how hard it is to capture these little monsters on film! Last edited by Stef333; 01/27/18 11:22 AM. Like you said, it is pink which is good, however, not something you want to see on your glider. Unfortunately I don't have any experience with this sort of thing, so hopefully Kim/Feather or someone else will come along shortly with some advice for you. In the meantime, keep watch. Hi-a Steph! How are you two doing? I haven't been on the board as much as I like either, as things are hectic right now. I hope you both are doing well and soon have a spot with more wifi access. About Yoda's tail, I think a vet consult would be a good idea. In the meantime, make sure you have stuff to treat handy should it get worse. Anxiety, or stress, as well as boredom,and health issues are usual causes for over-grooming. Process of elimation is the best approach. 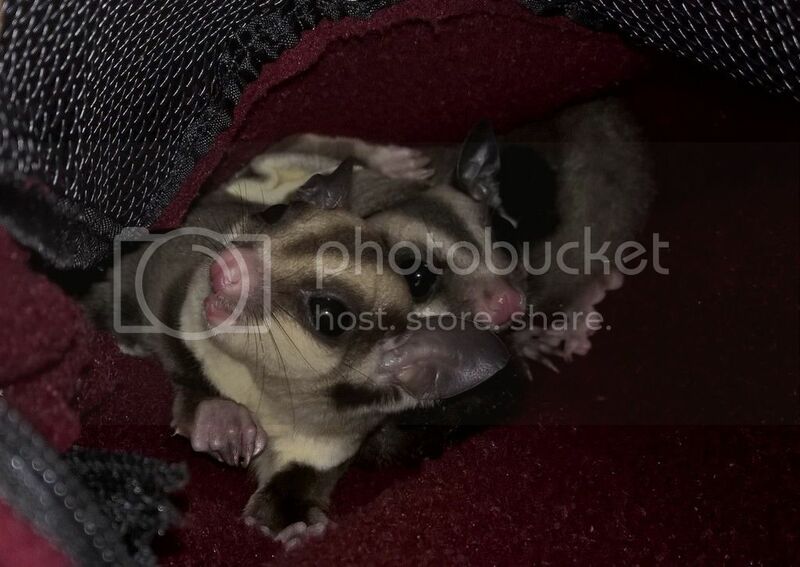 In the case of my Lulu, it was first thought because she was an easily and highly stressing glider. But since her passing, I have to wonder if it was due to undetected health issues, that possibly caused her to be so stressed easily or at least contributed to her sadly, early departure. It looks like he injured it at one time and amputated himself. Does he leave it alone now that it is healed up? If he is continually making his tail shorter you will need to take him to a vet and find out what is wrong. Thanks for the responses! I think that he still chews it from time to time, and it looks like it's been chewed recently. I was able to get a clearer close-up, which is attached. We're thinking that maybe he's stressed from our attempts to bring two colonies together, which we do maybe once per week. It's usually Yoda and the other alpha glider (TwoDog's boy Justin) who square off against each other through the bars. Yoda never seems very scared or upset, but perhaps he is expressing that through his tail. We're going to take a break on the neighborly relations for a while, and see if that helps Yoda's tail. I'm looking for an exotic vet in SW Arizona just in case, but the only one I've found that mentions sugar gliders so far is a clinic in Phoenix that appears to quote PP about the care and feeding of gliders, which makes me wary. If anyone can recommend a good vet in AZ, I'd appreciate it! Stef, did you find a vet yet? I tried to locate my notes of vets I found when I was living in AJ, but so far I can't find it. If I come across it, I'll let you know. Actually,I'm just checked our database, and there are 3 located in Gilbert, 1 in Chandler, and 1 in Mesa according to the DB. Also there is 1 in Tempe. I haven't checked them out to find if links are still good though. Oh, there is also one listed in Lake Havasu, that would be closer than the ones outside Phoenix. Gilbert and Chandler may be the next closest, heading east/southeast. Last edited by Terry; 02/13/18 12:10 AM.